Though people travel from around the globe to visit Robert Smithson’s monumental Spiral Jetty, located on the northeastern shore of Great Salt Lake, to this day some Utahns have no idea that one of the 20th century’s most iconic artworks exists in their own backyard. One who does is Utah art historian Hikmet Sidney Loe, who has crafted a stunning contribution to the already extensive literature on this iconic Earthwork. 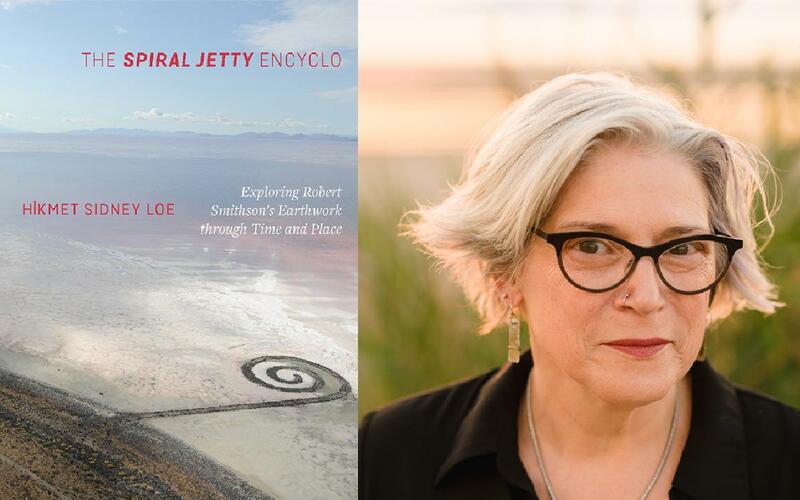 As its title would suggest, The Spiral Jetty Encyclo: Exploring Robert Smithson’s Earthwork through Time and Place is an exhaustively researched encyclopedia of all things Jetty, serving as an instantly irreplaceable source of knowledge of the subject. Smithson retained a fervent attraction to a number of ideas and imbedded them in his iconic Earthwork so that they could live on for an indefinite amount of time. His tragic death in 1973 prematurely ended his work’s infinite possibilities, leaving historians and art lovers to pick up the many threads of inspiration he left behind. Loe has been researching Smithson and the Jetty for over two decades, cementing her reputation as one of the nation’s preeminent Smithson scholars. Before becoming an “encyclo,” her book was organized in chronological chapters. It was after one of the book’s anonymous academic reviewers suggested that the book’s format was better suited to an encyclopedic structure that Loe realized the parallel between her enterprise and the Jetty itself. Much like Smithson’s spiraling thought process, compiled from a mixture of sources including microbiology, history, culture, and geology, Loe’s process was difficult to contain in a linear chronology. In subjects ranging from “Metronome,” to “Trans-Continental Railroad,” in a sense, the academic intensity of Loe’s process exceeds Smithson’s. In Part I of the book, Loe draws from Smithson’s own words by including his 1972 essay “The Spiral Jetty,” and an annotation of Smithson’s film by the same name, and finally Loe’s own annotation of Smithson’s collaborative film with wife Nancy Holt and fellow artist Michael Heizer, entitled “Mono Lake.” Any critical scholarship on Smithson would be significantly lacking without including Smithson’s own words to describe his artistic process, as he was just as visionary a writer and thinker as he was an artist. While the size of the book may render it impractical to carry in one’s fanny pack on the way to the Jetty, its life is far from destined to remain on a coffee table. Instead, this book is adaptable to the individual utilizing its vast resources. It belongs at once in the backseat of a durable vehicle, ready to be pried open at a moment’s whim when exploring the rich landscapes it spends its words carefully describing. Additionally, it is an indelible resource for the Smithson and Land Art scholar or student wishing to gain a critical art historical structure.